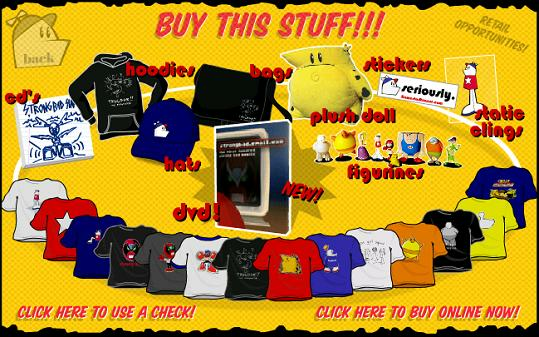 Homestar Runner Wiki Forum • View topic - Shop Our Store? Post subject: Shop Our Store? So I was pretty surprised today to find homestarrunner.com's front page looking different. Is the Store not accessible enough without giving it a giant button on the index page and coloring its navbar link red? I understand that TBC need to make money, but they definitely seem to be going in the direction of putting merchandising over content. Post subject: Re: Shop Our Store? It might just be because of the sale, but I was surprised by that too. I hope there will be some new stuff soon. Even if they only make like, one email a month (and nothing else). I saw the store in red and thought "New merchandise? "Then I went and was all,"Why the crap is it in red?" If there are two things I know about the Homestar Runner, is that everyone loves the him, AND he's a terrific athlete. Oh, uh... POINTY ELBOWS AAAND LOTS OF LIGHTNING!!! Has this change caused anyone ELSe to watch the intro more times in the last few days then ever before in the history of time combined? Or am I the only person unable to deal with change? Want money, make Toons. Give people a reason to go to the site. It's been a long while since there's been regular content, and though a good reason for that is another baby has arrived (congrats! ), putting a "buy some stuff" button there is cynical at best, and at worst a bit insulting. If TBC are bored with the site, by all means, stop what you're doing. But go out with a bang, not a whimper. Anyway, people would probably shop the store if the new DVD was available. I know I would. Is it just me or are the Brothers Chaps out of cash? I mean, all of a sudden, the main page has a store link. The navibar has store in red font. Red is almost always meant to be an alerting sign. So, what are they alerting us of? Well the shop is pretty much the only way for them to get money. And, I'm sorry to say this, viewership is declining. So what if 2010 is the last we'll see of Homestar Runner. Final episode, Series is over. I mean, it has to end sometiime right? The thought makes me sad too, don't worry. I'm just going to say it. Homestar Runner is in it's final days. If the Brothers Chaps quit it, well, what will happen? I'm worried if anything. Are you? Yeah, I pretty much love the Compy. Yes, I am a girl. Have you heard about their baby? They can't just leave it to one woman and go play with the website while she changes diapers! Plus, they wouldn't have made the 8-bit is Enough thing free. I was going to mention that. I forget!! Why would the shop link be on the main page and it be red on the navibar? Either they just could use extra cash and they are already super rich (or at least really well off)... or they had to get other jobs possibly because they don't make as much off the site as they did years back. I doubt they are running out of cash, but it's entirely possible that they are. I'm sure the sales aren't as good as they used to be but who knows. Alright, now that I've finally managed to make an account let me put my two cents in on this. First of all, a baby isn't nearly this time consuming. Think about it. You've lived with a baby before haven't you? I know I have, in fact I lived with two. Oh, and plus there was a kindergarten kid around to add to the hectic-ness. I managed to help take care of them (this included feeding, diaper changing, you know baby stuff) while more than keeping up with my homework and grades. Not to mention normally I had more than enough time to play video games in the process. I'm sure the reason they gave away SBCG4AP EP 5 on Trogday is because it's like an excuse for an update. I bet they figured most people who are gonna buy it have bought it already and it was only for a day anyways. It was something that was pretty easy to miss anyways considering they somehow "forgot" (or the site "glitched") to put up a link to Telltale games on Trogday and the only way to know what the Trogday surprise was to come here. Finally like it's been said before while they don't owe us anything they kind of do considering their popularity is solely due to fans. There's no adverts for Homestar Runner anywhere, the TROGDOR song getting into Guitar Hero was a request made by someone on the developing team as far as I know, and they're insanely popular considering how funny it actually is. Not to downtalk H*R but the last time I laughed hard at something on the site was probably Rock Opera. Ever since then it's really just the occasional chuckle to a slightly greater laugh. So personally I think the baby excuse is a cop-out and it won't be long before homestarrunner.com becomes homestarrunner.com PAY PLUS! If they are running out of money, I hope they don't end up making a downer ending. Remember how colorful their store used to be? I dont think they have hoodies or hats anymore. I hope they bring back the old trogdor hoodie. I was disappointed with the new zip up one they had for a while. One thing I really don't like about this increase of store advertisements is that now, I have to click Homestar's privates if I want to skip the intro. I don't mind waiting months for a new cartoon. The Brothers Chaps have been more than generous with their time in providing such a great body of work over the years. And they should, by all means, take some time off for the new baby and to enjoy life. But the combination of no new content WITH the marketing changes being made to the website itself is sending the wrong message. It's undermining the site itself and its credibility. 3. Adding that square ad for SBCG4AP to the main page (instead of just keeping the new messages in the oval in the upper-right-hand corner). In fact, the best marketing thing they can do is to add new content, because it keeps people like us returning to the site and clicking on all the links. So, and I know I may get flamed for this, I am going on a store strike: There are things I want to buy, but I don't want to encourage the emphasis of late on marketing over content, so I am going to wait until a new cartoon is up before purchasing anything. To reiterate: I have no problem with them stopping the cartoons to take a break and I have no problem with them trying to sell stuff to us because that's how they make their money, but up until now they've always done it in a classy way that made them stand out from all the pop-up and adsense-heavy websites on the Internet. And that's one of the things we love about the self-contained world they've created...and want to keep, even with the lack of updates. Really, I think that's fair. I feel much the same way about their red store link. I wouldn't go so far as to refuse to buy anything on those grounds, personally, but if people want to, that's their decision. I also completely agree that they need to put out new content if they want people to shop with them. It's a simple as that. That was really well said, and honestly, that's what has bothered me most. The break is annoying, I'd like more content of course... but it's their right to take a break. However, shoving their store in my face WHILE not providing anything new for months certainly doesn't make me want to buy anything. And I even kind of want a laptop skin. Thing is, I remember when they started this thing years back that they said there would never be advertisements on the site. And yes, there aren't, but they (to me) seem to be betraying part of what they said they'd never do. The marketing/advertising of the site is currently taking importance over content. The only reason we care! I remember them saying they should start a blog to keep us updated on breaks like this in the past, well it's not that hard to start a blog. They could do that in the absence of actually making cartoons to give us a reason to have invested interest in the site. Ebolaworld is a flash site (the Taco Man site) and although content is added on a very infrequent basis, the creator has a blog to keep you up to date on things going on and just random ramblings in general. I just wish they'd give us an idea of their intentions here. I mean, early November was the last time we got a cartoon. It's been almost 4 months. I would think the Feedburner page they've got ought to be enough; they shouldn't need a blog if they use that. Which they haven't been lately. So maybe that's what they should do. Okay, First of all. They are running out of money Because they CAN'T Make new updates. They're really hoping they don't have to get new jobs and such for that will leave hardly any time for Homestar (What with the baby and all). I don't know if it's a good reason or bad reason why they stopped, but they really need it, so go buy stuffs. Plus, I kinda like the fact that there hasn't been any updates in a while. It's really helped me appreciate/remember/catch up on all the old ones. Yeah, well, when you happen to watch a really great show on TV on its 13th rerun, and you never watched it before, you will appreciate that too. Doesn't mean everybody else has to. I'd like a star shirt to tell the truth, but how long has that been gone? Yep. Shortly after midnight this morning. My sister exclaimed "thank you" in a soft, relieved tone once I showed her that the Index Page changed back to the way it was before 2010.
will I'd like a star shirt to tell the truth, but how long has that been gone? It's been back for awhile now. It looks like they just ran out of stock back in April.